Having a car with great amounts of additional power and torque but with bad suspension can look like you’re in a bad racing game. It’s really important to cover every aspect when tuning your car, especially suspension. Many people tend to forget that additional power gain can make a car unbelievably unstable, especially in the corners. That’s the reason you need to think about the parts that keep your car on the road and your head on your shoulders. That’s why Bilstein rigorously test their products on the Nurburgring. Faster cars and tuning possibilities demand suspension parts that can handle the speed and put all that power to the wheels while enabling a comfortable and safe ride under heavy load. Driving fast around the track is extremely fun, but it can be dangerous. Frequent changes of direction, braking hard and accelerating will make you lose traction. Even accelerating without good traction will make you lose valuable time in a race. This is why good suspension is so important in motorsport. Tire manufacturers are constantly working on getting better traction but tires work with suspension to give the best results. To prevent losing traction, it is important to keep all your wheels on the ground. It’s the suspension that keeps the car from rocking left and right, nose-diving and keeping all four wheels on the ground for best traction. 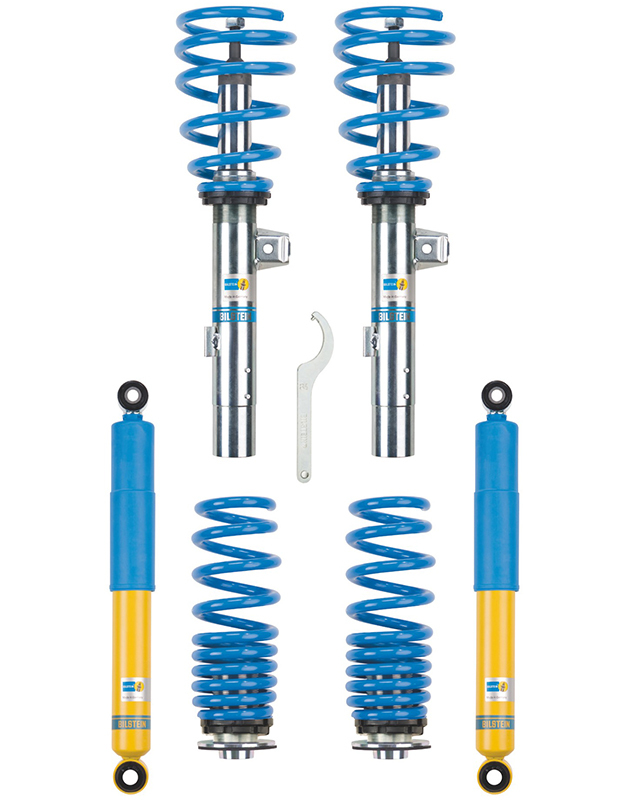 When you choose Bilstein’s B14 coilover suspension kit, you get everything you need. This particular suspension kit was tested on the Nurburgring under motorsport conditions so it will not only make your car look better by lowering it up to 50mm, but it will give you the performance you need for the track. You can even adjust the ride height so your car can be track-ready on the weekend and ready for driving to work on Monday morning. As every serious company should, Bilstein takes care of their customers. No matter what kind of car you drive, Bilstein got you covered. Products range from OE replacement parts, performance parts, parts for lowering, trackday and clubsport racing parts and even parts for professional motorsport racing. Don’t worry, there are also parts for SUVs, street rods and muscle cars, motor homes and heavy trucks. It’s very important to choose high quality replacement parts, not only due to better performance but for safety as well. Bilstein tests products in extreme conditions so the driver gets the most out of their new suspension parts. Some roads are not as good as others, so suspension has an important role in keeping the car stable and the passengers safe. Over 7.000 parts guarantee that you will find the right ones for your car. We often receive a remark like “Well, that is all fine and dandy, but where can I buy new affordable Bilstein products, here in the UK?” Personally, here at HPOM we buy our Bilstein shocks from a firm called Extreme-Carstyling.co.uk. They have the best prices, and trust us, we have done a lot of researching. Furthermore, the fast and most important of all free UK delivery is unrivalled.